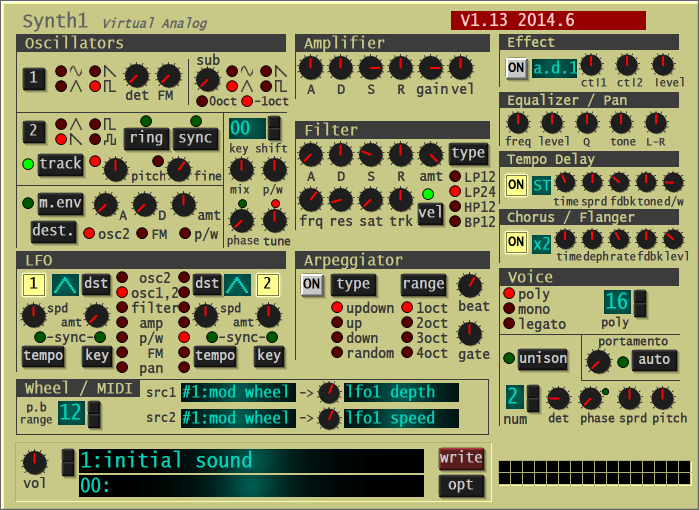 Synth1 by Ichiro Toda is a Virtual Instrument Audio Plugin. It functions as a VST Plugin and an Audio Units Plugin. Downloading and adding patches is easy once you figure it out. It looks like a great option for designing your own sounds for free. I use it on soundbridge and It works great. i don't know how long i use this synth already... it's still my go-to synth when i want a fast and inspiring workflow that gets me into trance as well. whenever i install my daw on a new machine synth1 is one of the first 3rd party plugins i install. If there is a free synth which can be compared to the top notch hardware like VIRUS or NORD LEAD. No other free VST has such distinguish hardware analog temper and sound . Many times i prefer to use simple construction preset and unbelievable sound from this less than 1 MB amazing VST than to start complex work on complex synths which may or may not sound 'right' in the end. It is so inspirational working with it you can make entire composition just until you look for something else. And there is so many free presets made for it, you just have to sort what your mix need or the ones made by advanced designers if need something 'pro'. Free hardware synth in a small VST box :). One of the best (if not the best) free synths of all time! It works with every host that I've ever tried (granted I'm on Windows and I don't use any weird/obscure hosts). Could use a GUI update and maybe a more intuitive preset browser, but then again it's free! Kinda sad that it's become Abandonware. 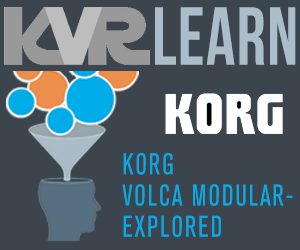 Awesome VST synth! There are hours and hours of enjoyment contained in this efficint little monster. Mhh... so a 5/10 rating, because your Linux software isn't capable of running VST's correctly? Just saying, because on any Windows host i tried Synth1 in, the arp, delay and polyphony work correctly... there's also no need to improve the synth, but the software you tried it in. Linux runs on UNIX, windows does not. What does that even mean? Unix is an operating system, Linux is a kernal that drive other operating systems... the statement makes no sense. Might as well claim that Windows runs on Mac. No Prolems running this VST under Linux - using Reaper. Everything works fine. May be you'd better stop now using this configuration.Because you obviously don't know how to use VSTs on Linux.A lot of users reported Synth1 working perfectly with Wine or Vestige. You'd better stick with Windows or Mac OS X...or learn HOW to use VSTs on Linux. But if you post bad reviews every time a VST don't work right on Linux, you are going to use your fingers soon. Hey guys, I'm intrested in synth1 on linux also, I think briandc is onto something, can you help us out? Maybe it would be better to deal with the message, rather than just shooting the messenger?? I've tried about 200 different free VSTs in VeSTige. Many of them have nice working interfaces, good arpeggiators, mono/poly functions that work just fine. Oh, one more thing: some of the patches actually make Synth1 crash. (Something that no other VST instrument I've tested does. few quirks, module dependant, while dongled apps, or those with custom copy protection intertwined with windows code unsupported by wine, always fail. As they should!. Wine has proven to draw gui better this year than last, as is it's history. New linux users who are musicians, should avoid updating a working daw box to the 'newest' linux, but they fall for it over and over and over. Musicians with supported hardware, a linux using friend, or the desire to learn the OS beyond audio production, have a bright future, as at least 5 audio production distributions are improving apace. distributions. The hardware detection and support are different, and nuances of software are different. A particular failure in one type of distro, is often fine in another. or an arcane sublimity in wine math calculations not liking a motherboard chipset. I asked looked at the presets, and saw no obvious symptoms. Just a note to say that I've been testing Synth1 with the Festige software on AVLinux 5.0.1. It works nicely here, and I've been testing it with various soundbanks. Great synth, very straightforward design with excellent sound quality. I won't give it a rating, I agree that it's a bit bogue to evaluate a Windows-based VST while running it on Linux. But as I said, IMO it's a great synth. Been using Synth1 for about 18 months now! I've auditioned just about every (popular) synth on the market (especially the FREE ones). I hate to admit this but Synth1 is even better than a few of the "paid version" synths. If you know synthesis, you can achieve some very nice sounds from this synth. Don't judge it based on the many presets available. Instead, use them as a "guideline" and create your own according to your needs & style of music. So my point is, if other "less popular" VSTs work so well, it's a shame that this synth, which has been highly regarded here at KVR, is not able to work correctly. At least, not on KXStudio. Maybe AVLinux is better, but I don't know, since FeSTige should be the same in either distro. So there must be something in other VSTs that make it more compatible, that is missing in Synth1. Again, it's not that I can't get Synth1 to work at all. It works. But the arpeggiator doesn't, and the mono/poly control is a bit confusing, since sometimes it indicates "poly" but I can't get more than one note at a time. Finally, some sounds cause it to crash entirely. Hi briandc. I have Synth1 running perfectly smooth with a configuration similar to yours, but with Reaper and wineasio. I know that Reaper is propietary software, but in not expensive, plus it has really good VSTis support under Linux. I have regular Ubuntu 12.04 with KXStudio repositories. You just need to install "wineasio" (should be installed with KXStudio) and install Reaper. Mine works flawlessly. Hope this helps. Hello again brian. I managed to run Synth1 also with dssi-vst. Just type in a terminal vsthost followed by the path of the dll for Synth1. I have tried dssi-vst, but it didn't behave any better than FeSTige (still had no luck with arpeggiators, mono/poly, etc). But I will certainly take a look at Reaper. I have wineasio installed in my KXStudio installation, and the people behind the project are working on integrating Synth1 into the Carla host. If that succeeds it'll be a great step ahead for the entire community, imo.. So anyway, a very happy ending. Synth1 is now working just fine, arps, polyphony and all. And no presets cause crashes. ;) Lots of neat effects and things, too. New to this. My first post. Have to contribute 10 posts before I can rate and review this truly excellent free 10 out of 10 gem. Been loving this one for simply ages. It's the cats pyjamas. Oops, I guess I just reviewed and rated it ;o) Only another 9 posts to go, then I'll give this Synthesiser the proper review I feel it deserves. The website in English... yay! Damn, I need it in Dutch! LOL. Could it be because of the 9000+ presets loaded? Removing them didn't make any difference, because the banks associations are still there and loaded in the VST host. This tune is made solely by synth 1 (at least 95% of sounds): https://soundcloud.com/dreaml4nd/dreaml4nd-synth1-draft1. Hey what does the "det" knob do on osc1 (I'm using current version of mac synth1). Certainly doesn't just simply adjust pitch. Usually detune would require more than one voice. It makes it sound quieter like a super weak sounding hoover. It's totally rubbish. Is it a mistake? 9/10 because it needs to become an AU instrument. I don't get this working on mac (10.8.4). I install it but logic wont recognize it, and wont appear in au list. what to do? it says not apple supported au or something. I just loaded synth 1 and five banks of presets to get started. Call me silly? I'm sure someone will. I cant seem to get any of the banks to load. Can someone give me advice on how to load presets into this thing? Is it supposed to come with initial presets? It seems make one sound on all the preset choices. how do you download one of these lol. Beside the picture at the top of this present page you have two links "Download". One is for Mac ! And where does it drive you ? To the links for MAC ! And not only in 32-bit but also in 64-bit . Ah yes... I understand now... you were talking about Designermonkey, not about Synth1 itself. I'm pretty sure that there is somewhere an equivalent for OS X. But in fact it is a management tool which makes a bit easier the management of the banks, and if you use the zip format (which is perfectly managed by Synth1) you could certainly make your own equivalent using a script language. But I'm pretty sure that there is somewhere an equivalent of Designermonkey for OS X.
Linux users would be very grateful. 1. Newer versions, with whatever other bug fixes and enhancements may be included, is essential due to the new patch-maintaining system. 2. As someone pointed out, google translate does a nice job, at least in English, of translating Toda-san's website. Give it a try. 3. His operation guide is concise and useful, but there are a couple controls that don't seem to be documented labeled "det". Does anyone know what they do? Thanks for your help, . the new LPLD filter in 1.13 beta 3 2014.7 has a bug that generates a CPU load of 100% when the amplitude release is maximum and the cutoff is modified in real time or with recorded automation immediately after altering the resonance and while playing fast alternating MIDI notes. There is another bug when you link the saw LFO to the filter and automate the freq... the LFO sounds weird! and I notice a strange behavior on certain point when I'm linking to LFO the PWM and the FM using square oscillators, it's been a while... like one year, since Ichiro Toda made the last update... the past time was like 4 years waiting from 1.12 to 1.13 beta so, someday he will fix it. >When you automate the LFO depth linked to the filter in saw wave using the mod wheel, it sounds strange. >Sometimes the pitch bends triggers itself. >When you use the LFO in Saw linked to Amp, it sounds some strange clicks and pops, for example, you make a sound using det 40 FM 77m 2 osc +15 tune +51 ADSR 0-127-127-77 2 (same with filter) frq 33 res and sat 0 trk 127 Unison 4 det 96 pitch -12 with nothing above 2.5kHz and you add 2 LFO's linked to Amp in key, first at (1) and amt 100, second at (4) and amt 55; you will notice a strange behavior, that's really sad because I don't like those "clicks and pops" in a dark sound. It would be easier if I could upload a picture and show you guys : (. My banks are not displayed in alphabetical order. They are displayed by the number of characters in the filename. See this image below. How do I get them to display in alphabetical order? This is weird, Synth1 has never given such a strange thing before. Hoiwz about saving them individual patches into a new bank in the order you prefer? Alphabetically? Most of the performers might save them in order of sequence for songs in a set. Then reload them for a particular performance program. Yet some of us save them by genre or sound type or by purpose, like FX and solo melody, monophonic, etc.. It's a cool synth. Programming it takes time. Try to find a work around solution. I think the idea behind it besides the obvious emulation of our favourite synth is being lightweight. I could go one by one and sort them myself but there's no guarantee that will work. And there's hundreds of them. Too labor intensive. And Synth1 does sort them right on my other two PCs. It's only my new laptop with a clean install that gets it wrong. Here's my other computer that gets it right (picture on link). First of all, I have never seen that sort of non-alphabetical behaviour in Synth1. Very strange, indeed. You might have been good enough to list your OS when posting the issue, as I very much think it is a setting within your PC that is causing this. This is because you say only that one machine does this. That's the culprit if using same version synth and same OS on each PC. Can't help you if we don't know anything at all about your actual hardware. Next, let me tell you about Synth1 patches, banks and what I, personally, did about them: I have salted away every bank I think was ever released for this wonderful synth. One week a couple of years ago I was asked to 'babysit' some friends' recording studio while the owners were on a brief 1-week convention trip. The place was only open for a few of their friends to drop by, do a bit of independent work, etc., and I was there just to watch over things. I spent several days auditioning just about EVERY Synth1 patch from every bank, re-arranged them into more logical banks, by type and quality, and tossed out perhaps a THIRD of all patches, as they were clearly complete rubbish made by idiots. But in some cases I found the very best patches in banks that were 50/50 in usability. Even though I mainly play the best commercial synths, I love Synth1 so much and so respect its creator, Mr Toda, that I will always be using it when I can. The effort was great but well worth, and I have all patches just where I can access now in mere second or two. Consider doing patch re-banking to solve your issue, consider putting in some 'sweat equity' of your own for being given such a respected AND free gift. I hope the lot of you complainers are aware that the latest couple of releases of Synth1 are BETA releases, and as such are not finished works and should be expected to have issues. If you can't handle this, why don't you simply install older versions and be done with all your grief?!?! I use version 12 still and have never had an issue - NO BUGS, NO COMPLAINTS. I am a working musician and simply have no time or tolerance for such nonsense. Why are you messing with betas, then having fits when you encounter trouble? Regarding kobraaji's LINUX issue, DO note that almost NONE of the commercial plugins that cost real money are available for LINUX, so why would you think that a softsynth of the quality of Synth1 that is not only free but also took many years of unpaid labour to reach its current state would come in a LINUX version, which would take many more hours of free labour and testing to port into that Operating System format? I think the burden should be on the one receiving the gift of this synth, to install an OS on his/her machine that is more generally accepted for making music. Or use Wine wrapper and just stop complaining. Next, you kiddies will demand that someone appear at your door and play the synth FOR you! Why don't you all take on some RESPONSIBILITY for yourselves to make Mr Toda's gift work on compatible systems and stop all this ridiculous whining. Spoiled children you most certainly are. "I'm a working musician and simply have no time or tolerance for nonsense"
"Almost none of the commercial plugins that cost real money are available for Linux"
"Why do you think a software synthesizer Synth1 quality that is not only free but also took many years of work paid not to reach its current state would come in a version for Linux?" just the fact opensource would do the job again as happened with oxefmsynth. "Stop all this whining ridiculous. You certainly spoiled children are." You may never come to linux, but this is the forum to share thoughts respectfully. "yeah, I'm a spoiled, and true artists too :)" ... well, at least you are honest. So ... didn't have time to cover all in my effort to defend Synth1, but I use LINUX Ubuntu everyday but mostly just to connect to the internet. I've toyed with doing audio/music and wasn't pleased with much of anything -- latency, behaviour in general, compat, you name it. Still have Audacity install, just in case must edit or playback and 'see' files, you know? Suggested Wine to you but actually I hate it, tho others love it. Only use LINUX to be more web-safe. Otherwise, I think it is clunky and stupid. Devs calling their software "canonical" and other stupid terminology. It is no wonde to me that LINUX never really made the big leagues and never will, considering the goofs in charge of it all. They offer software that is compat, you go to all this extra trouble to download and install, and the stuff is crap or doesn't work at all -- like they NEVER test any LINUX software, free or commercial. Everyone running LINUX is a bunch of Ibiza fruits. Screw them. Yes, I know, 'cause Synth1 is a freebie I am supposed to be too good to play it. Screw people who think that way, too. They aren't rich, famous and likely don't even have pot to pee in. Let them be losers and snobs and blind to good sounds and getting anywhere in music. I know a fantastic synth instantly when I heard this one. Mr Toda is a blessing to us all, even the dummies on snob sites. Let them waste their money on synths that have 300-page guides take two years to learn and four to get a decent sound! Meanwhile, some of us are livin' the high life, good lots of aclaim and don't associate with twisted wannabees. Enjoy your Synth1. Some amazing presets if you hunt, and programming easier than on most synths and with few limitations. I'm having some problems using this great sounding plugin. For me Synth1 seems to introduce latency when playing back. My MIDI notes are aligned to the grid but I can clearly hear, that the sounds from Synth1 are too late compared to the metronome. I used a negative delay to compensate and it was something between 30-40ms. It's not system latency because that way metronome and Synth1 would be delayed the same amount of time, right? It seems to affect all presets I tried so far. Any ideas? Axxl, Synth1 introduces no -- that is, zero -- latency. It must be something in your setup. What interface, what soundcard, how powerful is your computer? You did not spec any of these. The average cheapest interface these days should get you no more than about 6-7 ms roundtrip latency. Whatever the cause, Synth1 (or any other synth) has nothing to do with it. Latency is a system thing. Have compensation for latency in other plugins in your DAW? If not, why not. Good luck. Marla thanks for you help. I checked back and you're right, there are some presets like a kick drum for example that don't have "latency". So it must be the presets I've been testing. Is it normal that e.g. synth strings need 30-40ms to actually "be there"? If yes how can I tweak the settings so they are tighter, means need less time to build up the tone. At the moment when I align my synth strings to the grid they are too late. I never played keyboards before. Maybe if a human is playing that synth he would correct that already in his playing if that's a typical behavior for synths? Oh ...! That explains so much, believe it or not. I can tell you are a little new to softsynths and their behaviour, but that's fine. I think you explained the whole thing without us needing to talk gear and numbers for 15 minutes before solving. Okay, so ... some sounds and instruments, maybe most of all bowed-sounding strings, have very laid-back attacks when activated by a key on a controller keyboard, whereas most drum/percussion items have ultra-fast attack times. BANG, there's the snare or kick! A bowed note may go an entire measure before even reaching its full intended volume, almost like a true fade-in. Having little or no audible attack is a part of what can make stringed instruments sound so sweet, too. Still need to guess, but I think this explains all about what you are hearing. Some FX plugins, limiters, compressors can have significant latency, with hope made up for by the workstation's Latency Comp settings, but almost no VSTI (plugin instruments) cause any latency in the first place (unless they employ their own on-board FX set heavy, etc.) That's what was puzzling when you mentioned latency and Synth1 in the same sentence. So, what you are hearing with various soft-sounding string patches/presets and many other nice pad sounds is not actually latency but is instead a soft, slow volume increase happening along with a long and drawn out attack, the onset of the note. I'll admit, they can sound like true latency at times. Latency= nothing, no sound for X ms, then suddenly the overdue note. A swell with very soft attack=no sound, then gradually you begin to hear a little of the note, growing louder until it peaks. That's key: listening carefully, you should hear a little something albeit faintly with a swell. Put a graphic analyser plugin on there right after the instrument, and you should see at least a tiny rise of activity in some frequency (ies), even if very low dB. With true latency you see nothing, until note. EDM Soundset for synth1 - 50 high quality EDM presets useful for many genres of EDM (Electro house, dubstep, future house, hard dance...), you can find lazers, leads, 808 bass, pitched hardstyle kicks, arps, dubstep synths, screeches, plucks and more !!. 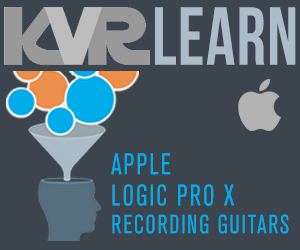 Does someone already have a problem with Logic Pro X ? I have to click 1 cm under a key to active it . Button sliders don't really work in Mac OS El Capitan. As soon as you click on any parameter, the mouse flies off to the other corner of the screen. Unusable. 1. Run 32-bit host. Not the best option, but it works. 2. Disable slider window in Synth1 options. Yes it has options! Press "opt" button at the bottom and uncheck "Slider Window" box. Completely right with you hoshino . Any beginners tutorials for synth1? What is a good patch to start with from a beginners point of view? They sound good the pads. Sorry for the newbie question but am I right in thinking to create a pad sound you use 2 sawtooth waveforms in both oscilators? I have a mistake with synth 1. I load a MIDI track in Logic. I load a sound a sound from a soudbank. When i press play, the sound return on init sound . Impossible to save the sound from synth 1. Synth1 is awesome, the sound is very versatile. But I have a problem of "shadow bank window" (stay in screen) ableton running in McOS platform. Sometimes the window does not disappear, it does not react to mouse click. I have to close abletonv in order to make it disappear. Anyone have this problem? help. Borges: I can confirm the same happens under OS X Yosemite (various versions), with Synth1 1.13beta8 64-bit 2015.5. I find that clicking on "List/Info" twice will hide this "shadow bank window". Guys, how do i load a specific preset on Ichiro's Synth 1 V1.13 beta (AU 64) 2015.5 on Logic pro x on my mac, i can't seem to find a way to open the .fxp preset i have in synth 1, i tried everything. Sorry for the possibly noobish question, thanks let me know :). Have a good one guys! Where do i put to .fxp file? When i click the opt button, these is no browse option in the mac beta version of synth 1. Hi, Im having trouble using Synth1 with logic x mac. Seems to crash once, then crashes again while re opening logic. Can anyone give me some advice? is the latest version ok with mac? Seems like a great synth with lots of 3rd party presets so id love to use it regularly. Hi, if you read my review (Blessing or Curse? A Synth1 Review) above you'll see that Synth1 has issues on Mac OS, while the Windows version is very stable. Mac OS version has more updates than Windows, but still not functioning properly, I tested it in Cubase 8.5 and Logic 9 and had the same experience. -Logic/MainStage won't validate it, which is no biggie, if you bypass it. -While switching presets sometimes it just makes a loud click (or a periodic clicking sound) and then becomes unresponsive. This can be handled with sending a MIDI panic message, but can be a serious PITA when you're using it live. Does anyone know of a solution to these? The Download page for this received a Page cannot be displayed? geocities.jp. Not working. Available anywhere else? Then you choose the first link which appears bellow the blue title. It's just one small ZIP file, with instructions on how to extract it and configure Synth1. If you should know about other banks that I have missed, PLEASE email them to me at pc@frankplads.com and I'll include them in the next update. Thanks. Hi, folks. I wonder if anyone has issues with Ableton, most recent Mac OS and Synth 1. I can't seem to get it to appear in either my VSTs or AUs. It used to, so I don't understand what has changed. Can anyone give me some pointers on getting my mac to recognize it again? Any help would be very much appreciated. Cheers!!. Hi mesuma, I know it is sort of a nuisance to rescan your entire VST library, but that may help if you have not done so? Options>File folder>Plugin sources... hold down the Alt key when you hit the "rescan plugins" and that will start the ball rolling. Hope this helps. Yep, I tried that every few weeks for the Iast year in the hope it would somehow recognize it. eventually got it working as an AU yesterday but it doesn't open in my saved sets as the original VST. So I need to open my old PC and see what the sound was originally then re-program the VST. It's a pain and a bit risky as I'm sure my old lappy is ready to burst in to flames. Glad I got it back but it doesn't really solve the problem, just adds more work on. Thanks for your reply anyway, man. Much appreciated. That said- you MAY want to try installing synth1 to another location and then creating a shortcut to that location and pulling that shortcut into your Live VST library? may be worth a go? Hope this helps too? Although Synth1 has many some issues, especially on Mac it is still a great synth. A review comparing the goods and bads: https://synthmorph.com/blogs/news/synth1-ichiro-toda-review-blessing-curse. And a free Synth1 bank with some additional twist: https://synthmorph.com/collections/all. this synth is absolutely amazing for a free plugin, but i am way bummed by its stability running logic 10.3.1 on OS Sierra 10.12.4 it will sometimes crash the whole program or it will make an extremely loud distorted noise randomly. logic is my only daw and i am dying to use this more stably. does anyone have any tips or suggestions? It's known to have some issues when running inside 64-bit host, if it's not critical (and usually it's not) — run its 32-bit version. [Self promotion warning ;) ]. Nice tool to use as complement to Synth1. Thank you. I have been looking all over their website: http://www.geocities.jp/daichi1969/softsynth/ in search for licensing information and I have found that the software labeled as "freeware". Which is good, but I still need to see a license file or something that tells me whether or not I can use the Synth1 synthesizer for commercial purposes. I haven't been able to track the developers down (sent an email to the only address I could find, but have not got a reply.) Do you know where I can find this information or a better place to contact the devs? Of course you can use it for commercial purposes. You aren't using anyone's copyrighted material in your song to start off with (Synth1 is not a sampler). It also is clearly understood that the purpose of a synth is to make music, so any restrictions on the use for that prpose would need to be explicit. This is because there is a reasonable expectation (or whatever the legal term is) that an instrument is intended to make music. Synth1 is Virus and Nord Lead software baby, cool definition - if use fx on it becomes Steroid baby :):):). The official website has been shutdown for good from today. RIP.